When some friends came to dinner a while ago, they didn’t want to arrive empty handed. Usually, you bring a bottle of wine, but as I’m not a big fan of wine at all, they wanted to bring something else. So they went to a cookery store and said to the lady behind the counter: we need a present for someone who loves to cook but already has everything. The lady knew just the thing, and that’s how I got my own Lékué macaroon set including a macaroon mat and silicone piping equipment. 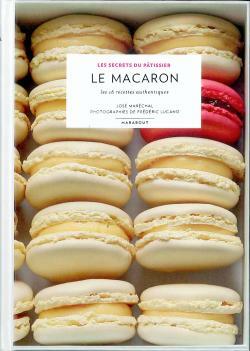 I already had the cutest cookbook on macaroons as well, the French book Les secrets du patissier: le macaron. I’ll admit, I mainly bought it for the gorgeous cover and the beautiful pictures, but it’s a fantastic book that helps you overcome your fear of tackling a macaroon recipe. So now, I only needed a good occasion which came about yesterday as we were invited to dinner by some friends. They have 2 little kids, so I assumed they would prefer sugar over wine too! 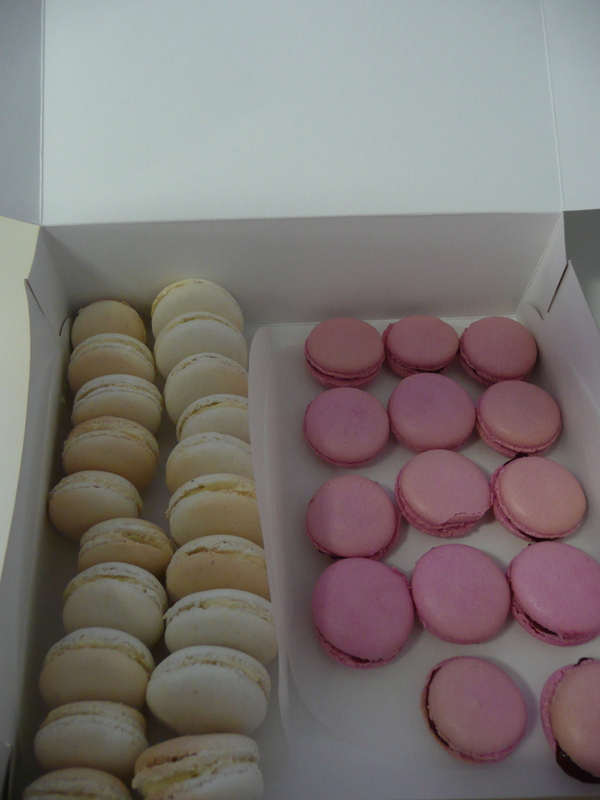 I opted for a batch of vanilla macaroons and a batch of raspberry macaroons, but the basic recipe is really the same. For 20 macaroons, first sieve 100 g almond powder and 100 g icing sugar in a bowl, stir to combine and set aside. Now make the meringue. 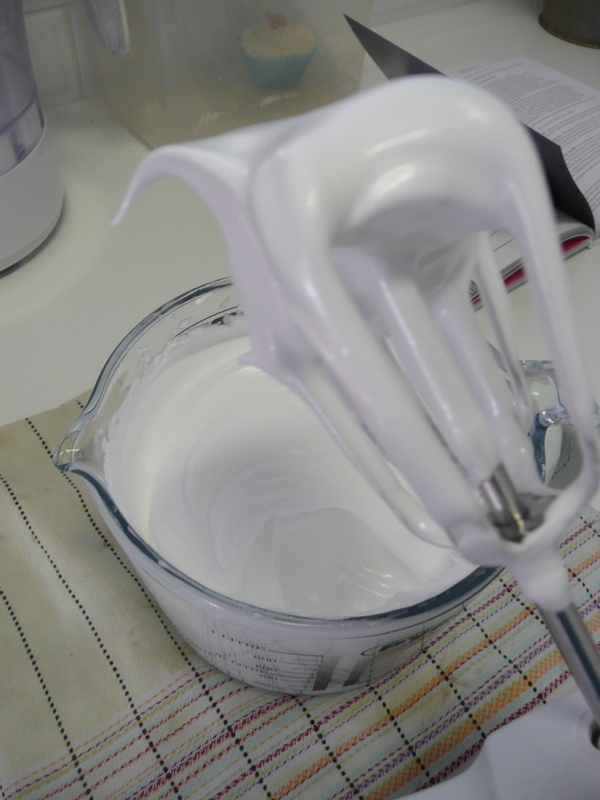 You have 2 options here, either you make a French meringue where you first mix your egg whites until stiff and then add the sugar and mix again (the easy version) or you opt for an Italian meringue, where you add a hot sugar syrup to your stiff egg whites. 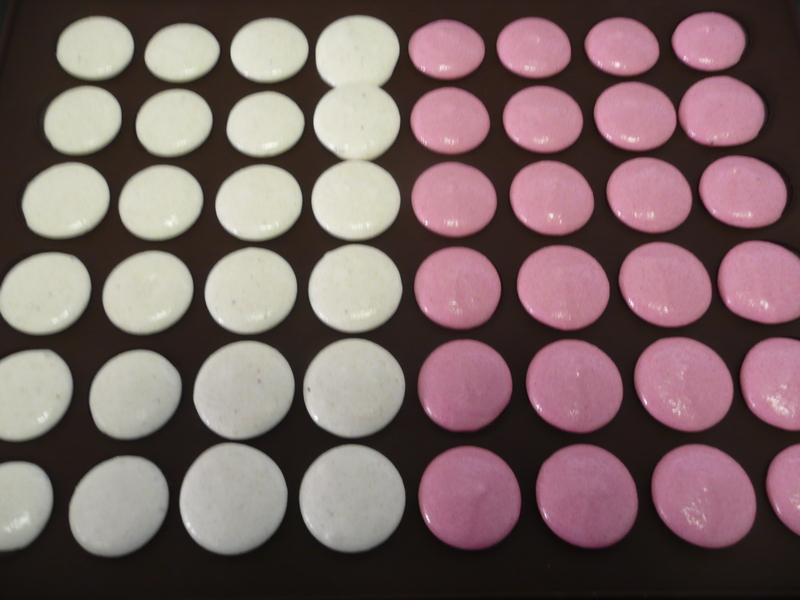 This is more difficult to achieve, but your macaroons can’t fail with the Italian version, whereas for the French one all depends on the precision of the rest of your actions. On my first set of macaroons a year ago, I used the French version and got hollow macaroons as a result, so this time I didn’t want to take any chances and tried the Italian meringue instead. For both versions, first mix 40 g egg whites until stiff (add a pinch of salt to speed this up) – you’ll need 80 g egg white which is about 4-5 eggs (egg white freezes really well, so when you only need the yolk for a recipe, like for bavarois for example, just put the whites in a freezer bag). 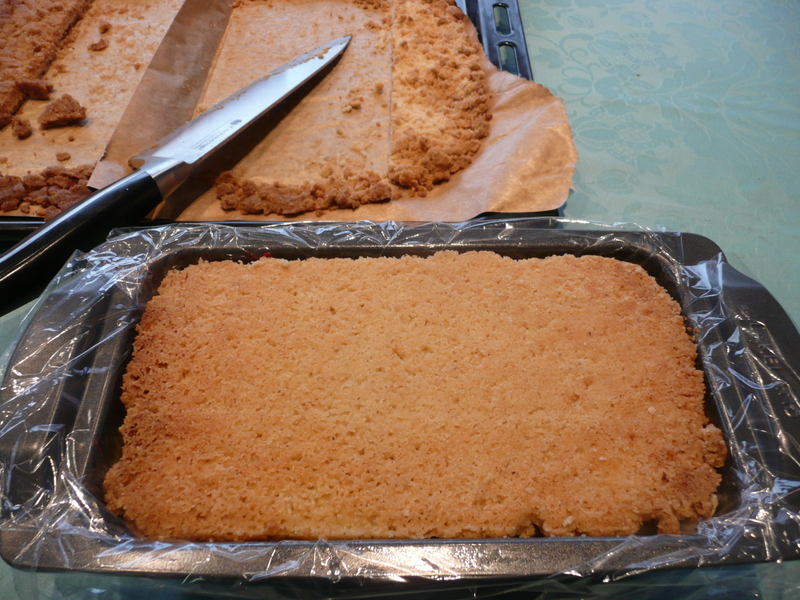 For the French version, add 100 g caster sugar in batches and keep beating until incorporated. For the Italian version, put the sugar in a small pan with 40 ml water and gently heat without stirring until the sugar is dissolved. Turn up the heat and boil for 8 to 10 min until the syrup reaches 115 C (you can measure this with a sugar thermometer. If you don’t have one, just boil the mixture until it starts getting syrupy and starts to thicken, you need something like a runny shower gel consistency). Gradually pour the syrup on the egg whites and keep beating all the time. Continue to mix for about 10 min to cool down the mixture a bit. 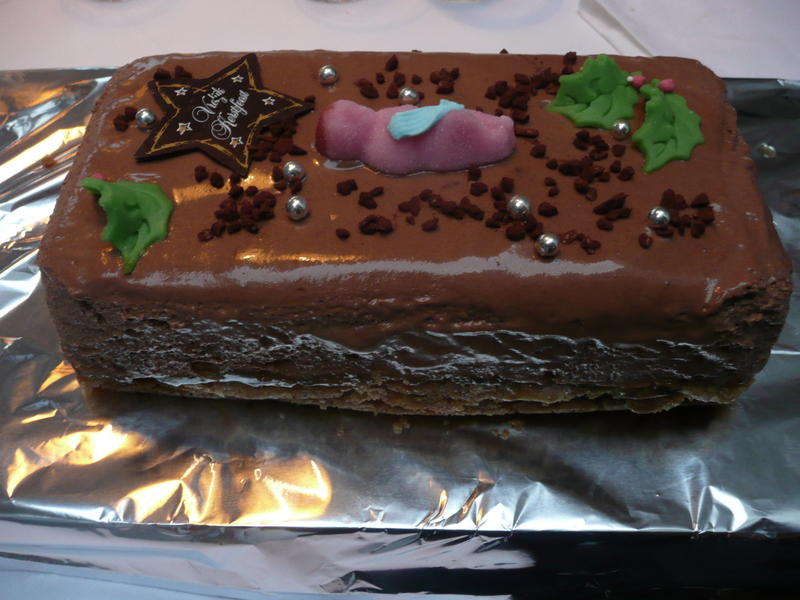 The result should be a glossy mix which holds it’s shape. 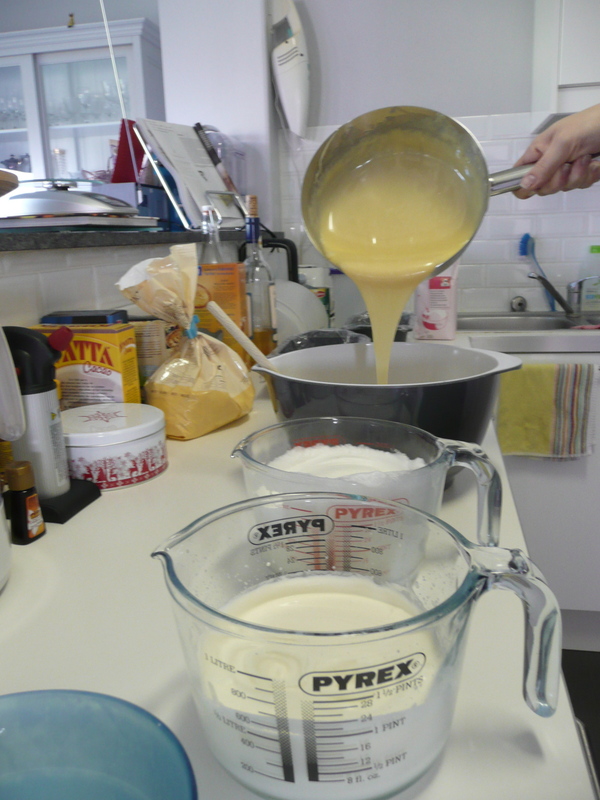 Now add 40 g raw egg white to your sugar almond mix and stir until well combined and you get a thick paste. This is were the two types start to differ: for vanilla macaroons, add the seeds of 1/2 vanilla pod or 1 tsp vanilla extract. 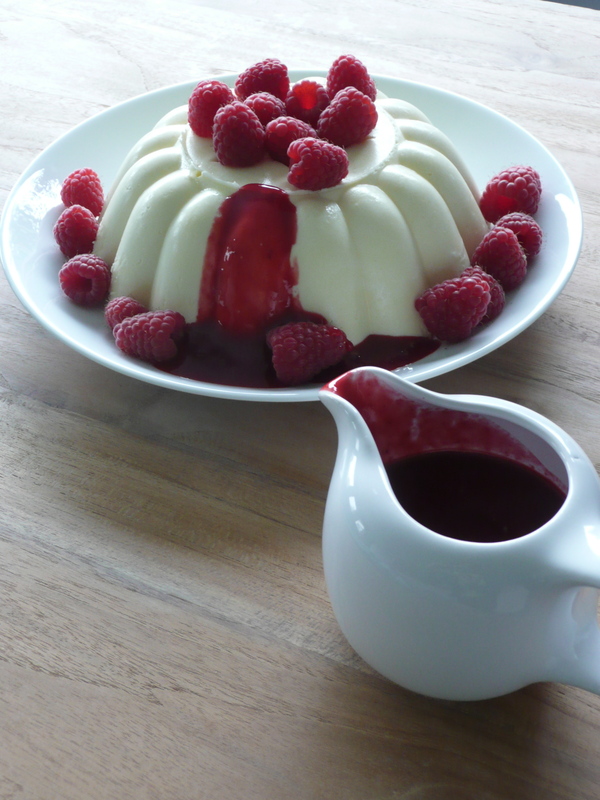 For the raspberry version, add a few drops of red food colouring (optional). Stir until completely combined (it’s a great work-out for your arms). Add 1/3 of your stiff egg whites to this and stir well to loosen the mix. Now add the rest of the egg whites and gently spoon through until it’s fully combined. Put the mixture into a piping bag and pipe small circles on a baking sheet. Leave to stand for at least 30 min (this is a very important step: by doing so, the top will harden a bit and will rise uniformly in the oven which means the macaroons won’t crack). 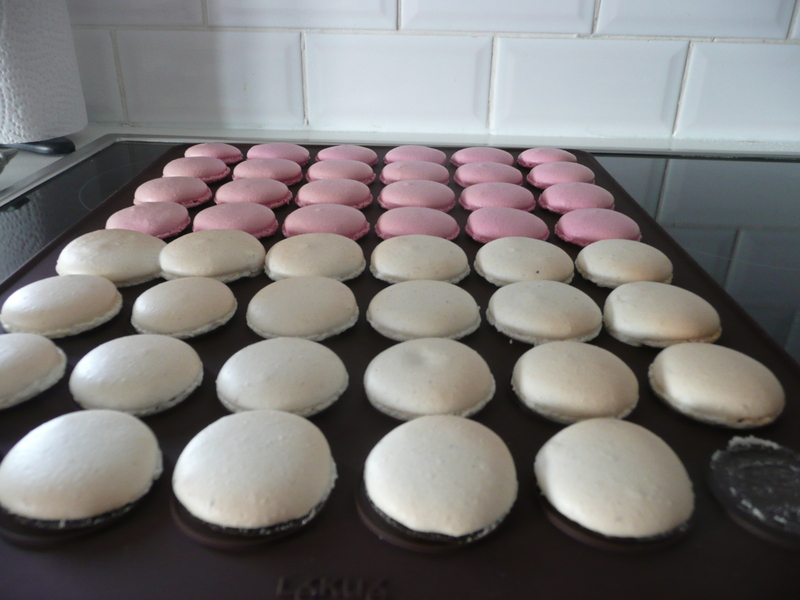 Preheat the oven to 140 C and bake the macaroons for 15 min. If you used baking parchment, the recipe suggests sliding the paper on a slightly humidified surface when they come out of the oven as this helps the macaroons to come of the baking parchment more easily. Once cooled, sandwich the macaroons together with the filling (after trying them first of course, being a chef has it’s perks). For the vanilla macaroons, I opted for a vanilla buttercream filling. 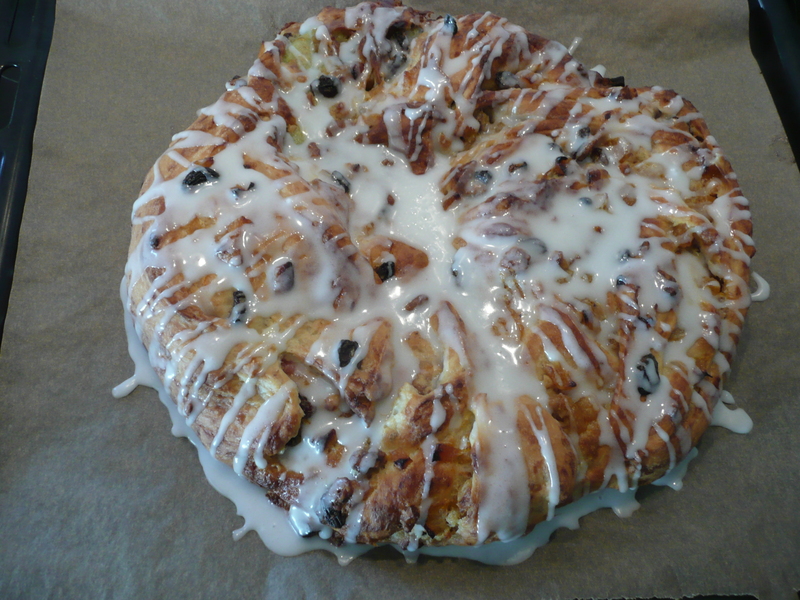 For this, mix 125 g softened butter with 70 g icing sugar, 80 g almond powder and 1/2 tsp vanilla extract. For the raspberry macaroons, I used shop bought raspberry jam (the recipe indicates how to make your own, but that’s where I drew the line). Put in a nice box for a great present or store in an airtight tin for yourself. They are best eaten on the day or the day after, but they will keep for a couple of days. Enjoy! This is another recipe from my New-Zealand cookbook A second helping by Alexa Johnston. 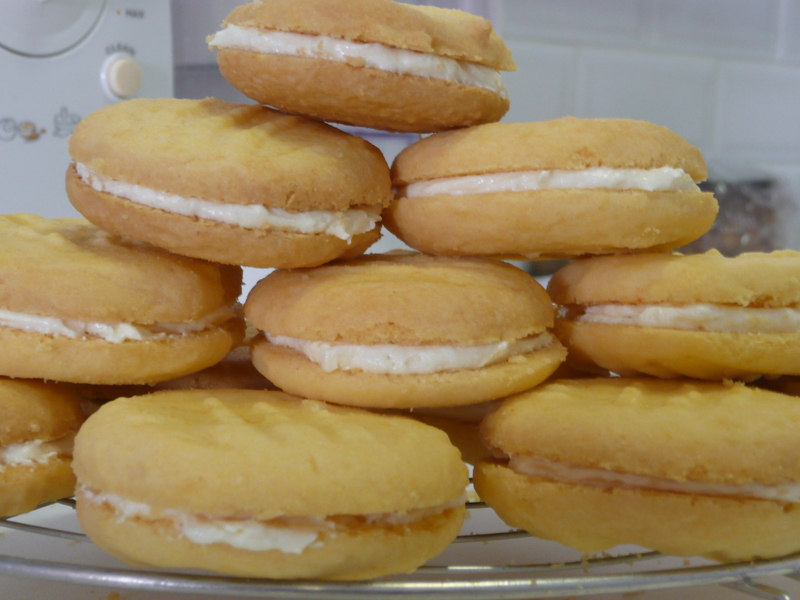 I ate a lot of these (also called Melting Moments) when we were on holidays in New-Zealand and absolutely fell in love with them. My favourite variety were the once containing passion fruit in the filling, so when I found the recipe from Australian chef Bill Granger, I just had to give it a go by mix and matching the recipes and this is the result! They last very long in the tin too (if like me, a flu is preventing you from eating them all at once. Can’t really think of any other reason you could have for keeping them). 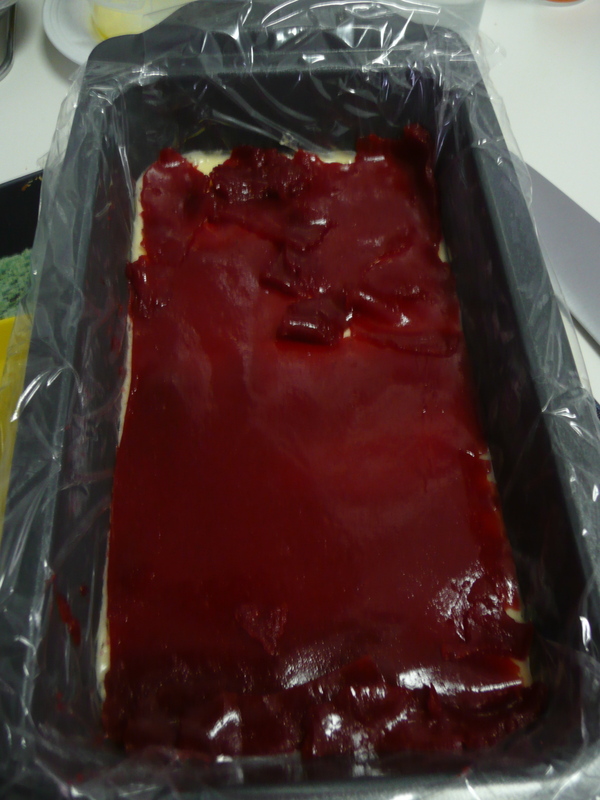 First, preheat your oven to 160 C and line two baking trays with baking paper. Cream 170 g soft butter (if it comes straight from the fridge, just put it in the microwave for no more then 25 seconds) until it is light and fluffy, then mix in 55 g icing sugar, 170 g self-raising flour (or use regular flour and add 1 tsp baking powder as well) and 55 g custard powder (I used the powder to make vanilla pudding. If you don’t have this, you can use cornflour instead). Take a small teaspoon of dough and put it on the baking sheet. Continue until all the dough is used up. Don’t bother counting them: if you have an even number, great for you, if not, that’s the cookie you can eat to make sure they’re all good! Now use a fork dipped in water to flatten them a little (this will add some lovely lines to your cookies too). Bake for 15-20 min until the biscuits are a very pale gold and slightly browned at the bottom. 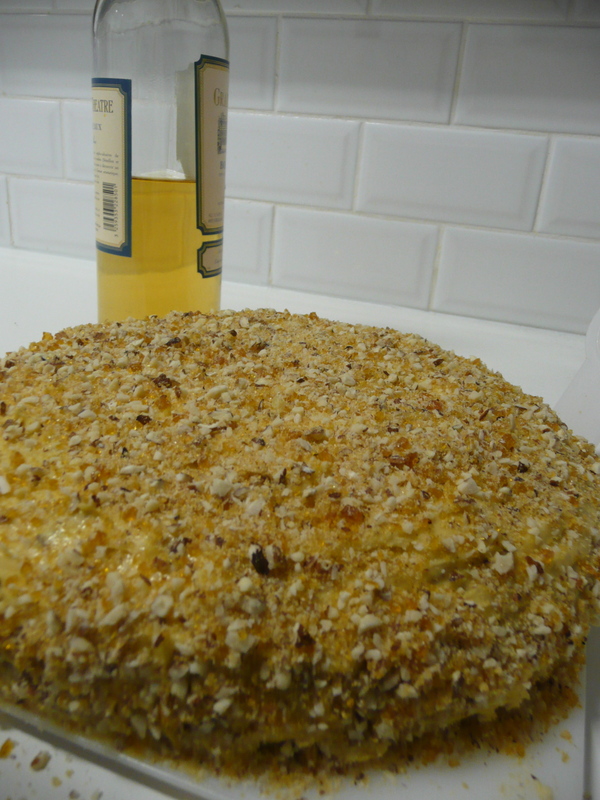 Leave to cool slightly on the baking tray before transferring to a wire rack. Careful, they are very crumbly! Don’t worry too much if some break in half, you can stick them back together again using the passion fruit cream as glue. While the biscuits are cooling, make the passion fruit cream beating 60 g soft butter until fluffy. 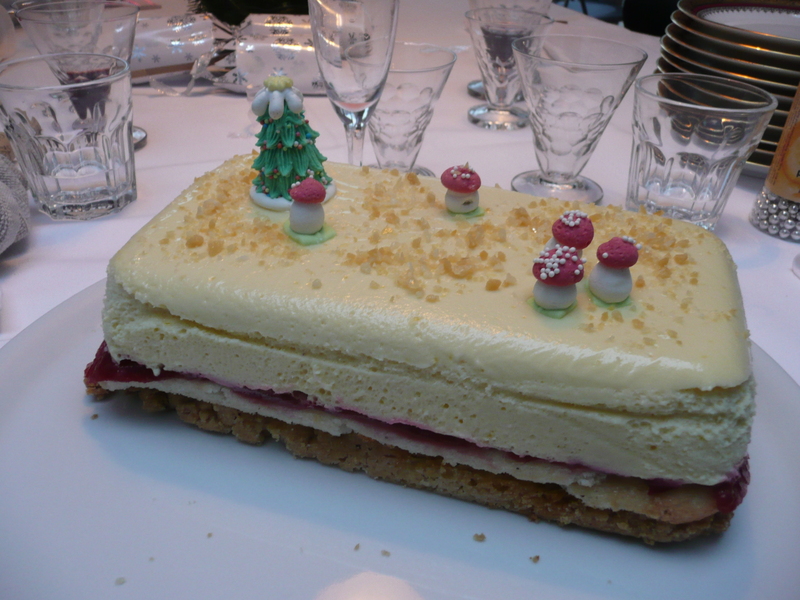 Gradually add 125 g icing sugar until light and creamy. Beat in the juice of 2 passion fruits (push the flesh through a sieve you are left with only the juice). If you don’t like passion fruits, just use a tsp of vanilla extract instead, or go for a fresher taste with a good squeeze of lemon juice. Mix and match the cookies to find 2 of the same size and stick them together with a dollop of the passion fruit cream. Admire your work before storing in a cookie tin. Enjoy!